You are here: Home / Recipes / GREEK PITA BREAD RECIPE – easy and tasty! GREEK PITA BREAD RECIPE – easy and tasty! Greek Pita bread is an ingredient always present in my fridge or my freezer. This recipe is very simple to prepare and easy to store and reheat. 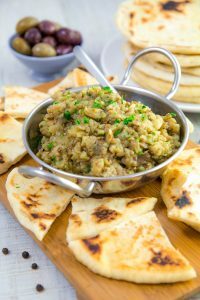 I love to pair Pita with my preferred appetizers and salads, or filling it with roasted meats, or simply seasoning with olive oil, oregano and sea salt! 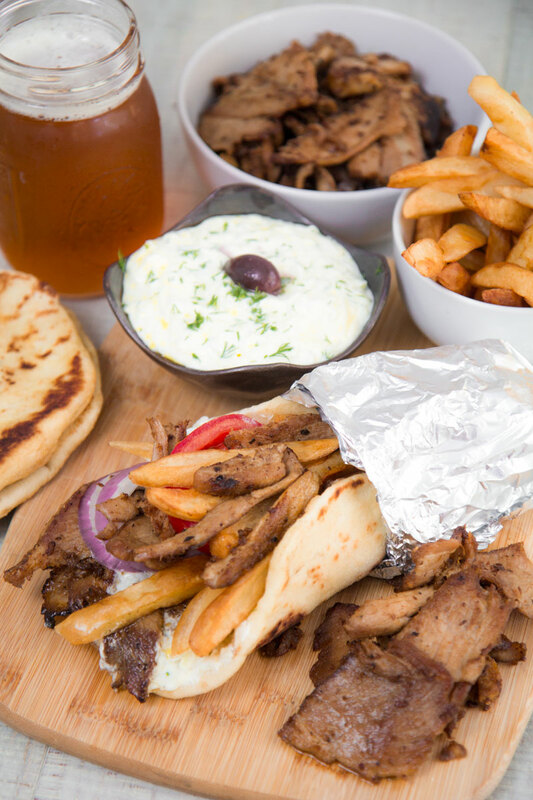 Whether it is breakfast, lunch or dinner, every time is Pita time! Greek Pita bread is one of the most ancient known bread. The recipe derives from the middle eastern Pitas. Originally, Greek Pita was prepared with barley flour, and later with other cereals. 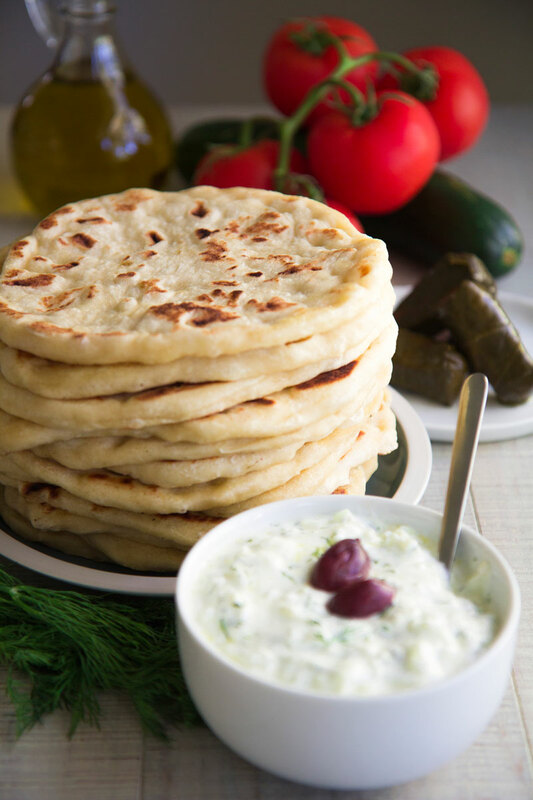 In Greece, like in many Mediterranean countries, Pita bread is an unique element on the table, served along with appetizers like Melitzanosalata, Greek Salad, and Tzatziki, or filled with Souvlaki and Gyros. First of all, pour the lukewarm water into a bowl, then add and dissolve the dry yeast along with the sugar. 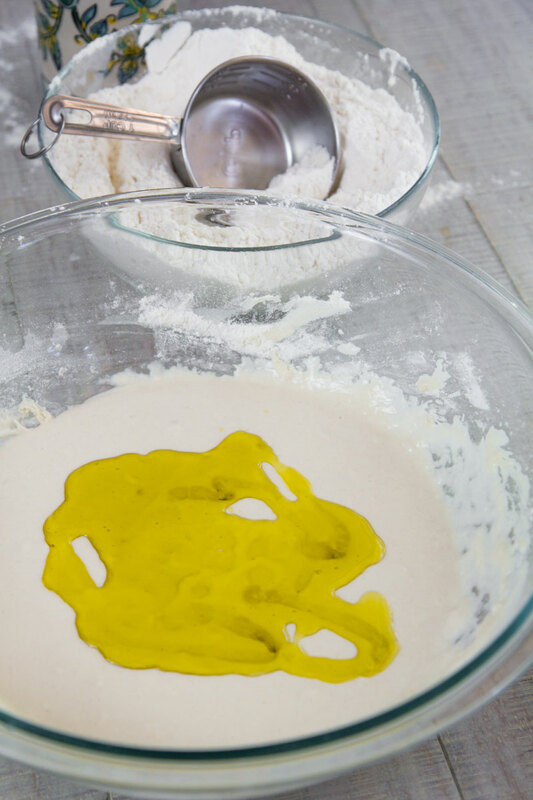 Now, add half of the flour amount into the bowl, stirring, then add the salt and the extra-virgin olive oil. Continue to add flour stirring until the mixture becomes dense enough to be worked on a wooden board. Knead the dough adding more flour if necessary, at least 10 minutes more until the Pita mixture becomes smooth and elastic. Finally, let the dough rest on the board, covered with a dampened kitchen towel a couple of hours, until double its size. A cast iron skillet is the best choice to cook Greek Pita. Place the skillet over medium heat and grease the bottom with a thin layer of extra-virgin olive oil. After that, pour a little amount of flour on a board and shape the first dough ball into a circle 1/4 thick, letting the other balls covered. 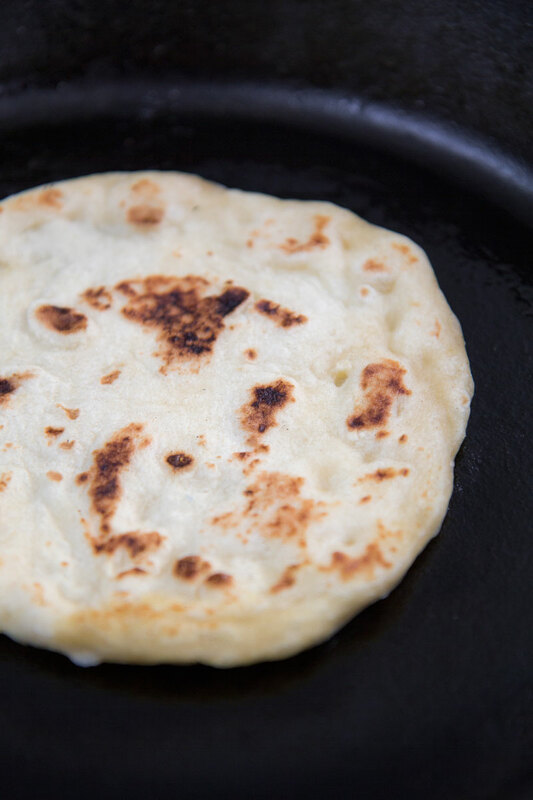 Once flatten, you want to cook Pita as soon as possible. Now, place the Pita on the hot skillet and cook about 1 minute per side. If this is the first time you prepare Pita, probably you need a couple of Pitas before guessing the right heat intensity and cook timing. 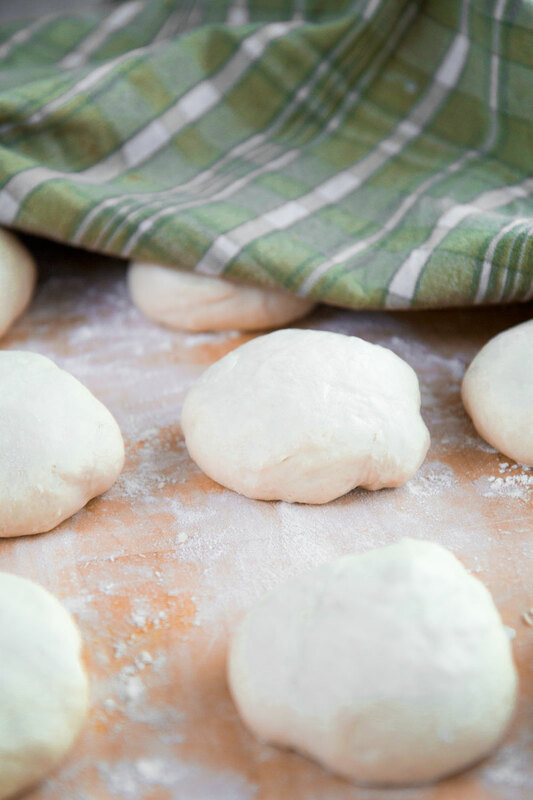 Repeat the process with the other pieces of dough, and pile the cooked Pitas to maintain their moist. If not served immediately, close the Pitas in a plastic bag and store in the fridge up to a couple of days. Alternatively, freeze up to 3 months. Once you need pita, just reheat in the oven a few minutes. GREEK PITA BREAD RECIPE - easy and tasty! A cast iron skillet is the best choice to cook Greek Pita. Place the skillet over medium heat and grease the bottom with a thin layer of extra-virgin olive oil. 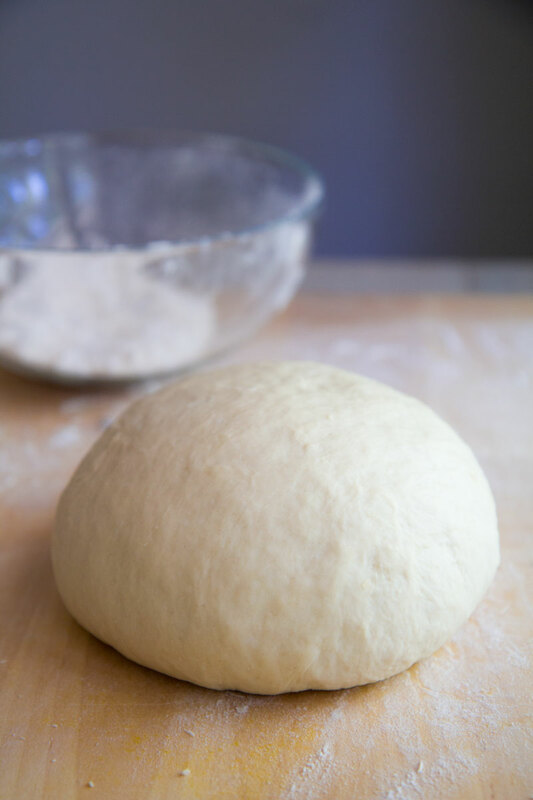 After that, pour a little amount of flour on a board and shape the first dough ball into a circle ¼ thick, letting the other balls covered. Once flatten, you want to cook Pita as soon as possible. I always wanted to know how to make pitas! Excited to try these myself! Cool! If this is your first time, just remember to use the first attempts to set the power related to your heat and skillet. This recipe was read very user friendly. I cannot wait to make this. Thank you for sharing. This is so delicious!!! My kids love it!!! I didn’t have bread flour; so, I used unbleached wheat flour. It came out good. The recipe is very easy to follow! Thank you! Love the simplicity of the recipe! Just finished making them to go with a Greek chicken dinner. Next time I will spray the parchment with pan spray so that the balls won’t stick to the parchment . Damp cloth over the dough to rise worked great! Best pita ever, was the comment from one of the people I made this for last night! This recipe works really well and produces beautifully light and tasty Greek pita bread. Going to make these today with greek meatballs. Can’t wait to see how they turn out. Will let you know tomorrow how everyone likes. Taking to a cookout. Great recipe! Thanks. I will definitely make now..
We tried these with oil, salt and oregano at a Greek restaurant yesterday… and the kids loved them. It’s hard to say, because the right temperature is depending on your stove and skillet. I suggest you to start with medium heat, then modify the intensity if necessary. If it is your first time, you want to prepare more dough for the first attempts. Thank you for this recipe! It makes amazingly delicious pita bread. The flour and water measurements are perfect; I didn’t have to make adjustments like I sometimes have to do with some bread recipes. I used organic unbleached all purpose flour since I don’t have bread flour. It was my first time making pita bread and it was so easy! Amazing recipe! Very easy to follow and detailed enough for someone who’s never made pita before to follow along without messing it up!